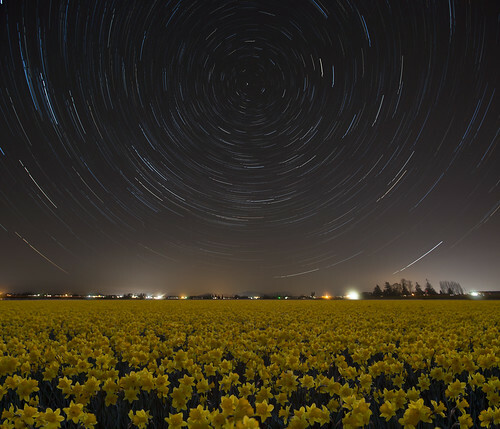 Star Trails and Daffodil Fields, originally uploaded by mfakphoto. The Pacific Northwest is a beautiful part of the country and we have fantastic daffodil and tulip fields in the Skagit Valley of Washington State. The winter and spring weather, however is usually overcast and rainy. But Mother Nature surprised us one night with a completely clear evening and night! After photographing the gorgeous daffodils at sunset, I stayed to watch the stars come out to play and dance against the night sky. A rare treat for March in Washington.